4 Stocks With Better Dividends Than Alcoa Inc.
Alcoa's a metal and parts company in transition and has a diminutive yield. Here are a few options that offer more punch. Alcoa (NYSE: AA) is one of the largest aluminum and parts makers. It's struggling through the commodity downturn while looking to break itself in two. For someone looking for a special situation it's an interesting story, but dividend investors sure don't have a whole lot to get excited about. 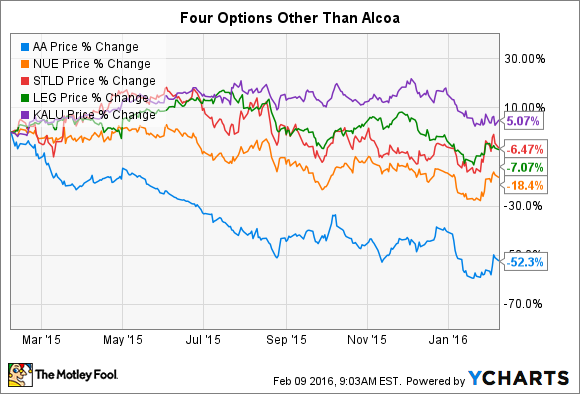 Here are four "similar" companies offering more than Alcoa's meager 1.5% yield. The core of Alcoa's business is aluminum. It makes the metal and specialty parts out of aluminum and other metals. But aluminum isn't the only metal that's been in the doldrums. Steel has been hit hard by the commodity downturn, too. But, surprisingly. that's why you might want to look at Nucor (NYSE: NUE) and Steel Dynamics (NASDAQ: STLD). It's true that aluminum is displacing steel in many applications, but steel is still an important part of many industries, ranging from construction to automobile manufacturing. The big steelmakers plan to keep it that way, too, as they increasingly look to move upscale. For example, Nucor and Steel Dynamics are both working on specialty steel that's light and strong to maintain the metal's dominance in the auto sector. In fact, moving up the "value chain" is a key goal for Nucor. For starters, it helps the company fend off the competitive threat from imports and alternative metals such as aluminum, but it also means it can charge more money for the steel it's selling as compared with more commodity-like products. As an example of the company's success, it was able to grow its shipments to the auto sector by 20% year over year in 2015. That's basically the same logic Alcoa's followed as it's built up its aluminum parts business. Steel Dynamics, meanwhile, is on the same bandwagon, with CEO Mark Millett noting that the company was able to achieve utilization of around 73% in the fourth quarter versus the industry's 65% partially because of its value add products. Both Steel Dynamics and Nucor are profitable in industries where many competitors are bleeding red ink. And, perhaps most important here, Nucor yields around 3.8% (with a multi-decade record of annual disbursement inreases), and Steel Dynamics yields around 3.1%. In other words, you have two steel industry leaders that both more than double what Alcoa offers dividend investors. That's assuming, of course, that you're willing to step outside the aluminum space. Another company you might want to look at is 3.1% yielding Leggett & Platt (NYSE: LEG). Leggett & Platt is probably best known for making things such as bed springs and retail fixtures. However, in recent years it's pushed into new markets, including aerospace. That's one of the core growth markets for Alcoa. The relatively small industrial company's business has been sluggish of late, as it deals with weak economic growth. However, its specialized products business, which houses its aerospace products, managed to grow revenues 7% last year and expand its EBIT margins. This segment, which makes up about a quarter of revenues, is by far Leggett's most profitable. Like Nucor, Leggett has a multi-decade history of increasing its dividend each year. Couple that with a yield -- 3% -- twice as large as Alcoa's and this metal fabricator is worth a look if you have been interested in Alcoa but want more dividend income. Note, too, that Leggett doesn't make metal. It just makes parts, which is essentially like Alcoa's so-called Value Add business, which is set to be spun off later this year. If you just can't get yourself to look at a metal other than aluminum, then you might want to dig into Kaiser Aluminum Corp. (NASDAQ: KALU). The company is much smaller than Alcoa but, like Alcoa's Value Add business, is focused on specialty aluminum parts. The aerospace and automotive sectors have been key growth engines for the company, with revenues in each sector expanding by an annualized rate of around 12% over the past decade. Such value added businesses represent around 60% of revenues. The stock yields around 2.4%. Not as much of an uptick as offered by the other three companies, but it's still nearly a full percentage point more than Alcoa. And Kaiser just upped its dividend by 12%, another positive for dividend investors. Alcoa's dividend has been stagnant since falling to $0.12 a year per share in 2010. That said, Kaiser's earnings this year are clouded by a big one-time item from the first quarter because of changes to its retirement plans. That, however, has little to do with its business results on an ongoing basis. So take 2015 results with a grain of salt. They aren't as bad as the GAAP numbers suggest. At the end of the day, if you're looking at Alcoa and feel the yield is a little light for your taste, there are other options for you to consider. Nucor and Steel Dynamics, while focused on a different metal, are both working to move up the value chain, much like what Alcoa has been doing with its business leading up to its pending breakup. Both offer yields that are at least twice as high as Alcoa's. Leggett & Platt, meanwhile, just does parts and has been looking to aerospace as a growth engine -- just like Alcoa. It yields more than twice as much as Aloca, too, if you can look outside the aluminum box. Even the aluminum buff, however, can find a higher yield at a company like Kaiser Aluminum, which is similar in nature to Alcoa's Value Add business and, like Leggett, is growing in the aerospace market.